Our waterfront 2-bedroom condo is sunny, comfortable and beautifully decorated - with a gorgeous sunset view from our deck. Second bedroom can be used instead as a workout room - complete with mirrors and hand weights. Big screen TV and wifi internet access. Best of all, we're a 5 minute walk from the center of downtown Portsmouth and dozens of fine restaurants, shopping and cultural attractions. Historic downtown Portsmouth is an active seaport and popular vacation destination for both US and international visitors. This delightful city boasts delightful shops, fine restaurants, live theater, sidewalk cafes and picturesque tugboats, and lively nightlife. The Prescott Park Arts Festival (home of outdoor summer theater and other shows) The Music Hall performing arts center, two harbor cruise lines and the Strawberry Banke historic site are all right here, a short walk from our condo. We are licensed by the State of New Hampshire: #058655 . Condo faces a tidal pond. Our waterfront 2-bedroom condo is sunny, comfortable and beautifully decorated - with a glorious sunset view from our deck. Second bedroom can be used instead as a workout room - complete with mirrors, DVD player, weights and other equipment. Best of all, we're a short walk from the center of downtown Portsmouth, and dozens of fine restaurants, nightlife, harbor cruises, performing arts, shopping, historic and cultural attractions, including the outdoor Prescott Park Arts Festival. The condo is ideal for two couples or a family of four; please note that guests must be able to climb stairs. We had a lovely time staying at Bill and Rebecca's condo. We stayed for four weeks, and it was fabulous. The unit was exactly as described, very comfortable for the two of us. It was well-stocked with everything we needed to make it seem like home. The location was perfect, as it was so easy to walk into Portsmouth (which we did most every day), and to access all the nearby sites. Rebecca and Bill were very responsive. I highly recommend this property! We loved being in this lovely condo, a few minutes walk from the center of Portsmouth. It was fun being on the water (North Mill Pond) and watching the tides come and go. The location was perfect for us. We've stayed in lots of places and have learned to bring some pans with us from home whenever we could. It wasn't necessary at Rebecca's. The quality of the cook ware was fine. In fact, we appreciated the art and artifacts on display. These folks have traveled a lot. Rebecca responded immediately to every request we had. This is a town house, so there are a bunch of stairs from the front door up to the living areas and another flight up to the bedrooms. We managed fine, but it is something to be aware of. We roamed around Portsmouth a lot (we stayed for a month) and loved the variety of restaurants, shops, and walks. Our favorite for lunch was the Beach Pea in Kittery, Maine, right across the bridge from downtown Portsmouth. Very walkable. Two of the best sandwiches (the bread was amazing) we've ever had. We loved walking on the beach at Rye, NH, Ogunquit and Kennebunkport, ME. A great month. Portsmouth is a delight any time of year - including February, as these wonderful guests discovered. 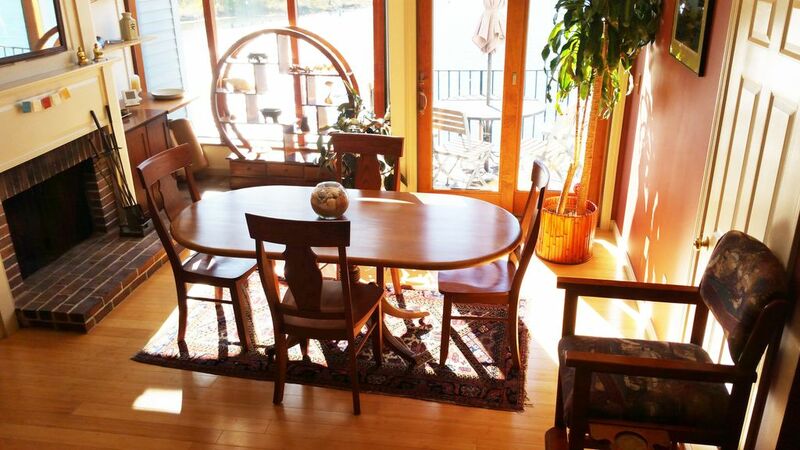 A convenient location with a short walk to Market Square, Music Hall, Prescott Park, many restaurants, the library, historic home tours, city tours on foot and bike, bike rides with the ocean as a companion, harbor tours, and so much more. A marvelous view facing the tidal pool; interesting to watch the tide ebb and flow. A very comfortable condo that quickly became my 'home.' Rebecca and Bill were very personable and welcoming. This September will be our 5th year to stay in this condo, two of us. We are so happy with the privacy, convenience to town, friendly leasors. The area has everything to offer – gorgeous scenery, outdoor adventure, fabulous restaurants, lively local nightlife and Boston’s rich cultural resources. One hour to Boston, 45 minutes to Manchester and Portland. Condo is 5 minute walk to Market Square. Golf: Several public and private courses nearby, including Pease Golf Course, Wentworth by the Sea, Portsmouth Country Club, Abenaki Country Club.